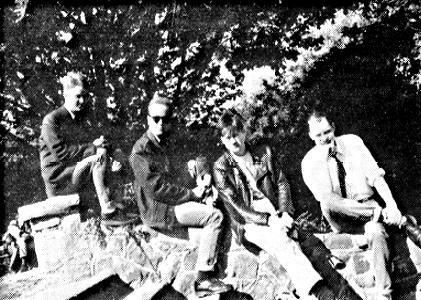 Hey Paulette were formed, in Dublin, in 1987 by Eamonn Davis ( vocals and guitar ), Derrick Dalton ( Guitar ) and Colm Fitzpatrick ( bass ). Drummers were always a problem and, though he never actually joined the band, Darren Nolan became their permenent " temporary" drummer. This line-up was augmented, towards the end of their career by the ex-Stars Of Heaven guitarist Stan Erraught. Few copies of these survive but Derrick just found 500 copies of I really do love Penelope, in his parents attic, should there be a sudden rush for these classic recordings. Their debut single got them the attention of John Peel who played it regularly and gave the band a session, after the playing of which, he memorably stated ( memorable to the band anyway ) that he thought there would be " a big yes to Hey Paulette.) Unfortunately, there wasn't and the band succumbed to the usual personal and musical differences, sometime in 1991.